One of the main diseases, which has affected wildlife in the world, is intestinal parasites infection. Ruminants are, undoubtedly, the one of the most important helminth infection hosts. There are about 50 species in the gastrointestinal tract, five species in the lungs and at least five species in the liver of ruminants in Iran. Other organs are also subjected to helminth infections, however, are not associated with certain clinical signs. Nevertheless, they have negative effects on livestock products and reduce productions of meat, milk, wool, and twinning (in small ruminants). They also make them vulnerable to the other diseases and cause high economic losses.,, Persian Gazella is a native, protected species in the central and southwest Asia. Neck below of the male Gazella becomes tumescent during the mating season and thus this species is known as the goitered gazelle. This species has an average size. The males have relatively long S-shaped horns which look like a Cheng. Females have usually no horns [Figure 1]. The Ghamishloo National Park and Wildlife refuge with 113,000 ha is located in the 45 km of the north west of Isfahan city in central Iran [Figure 2]. So far, 344 plants, 37 mammals, 82 birds and 32 reptile’s species, along with two amphibians species have been identified and recorded in this area [Figure 3]. By the interval of visiting from early May to the late August 2016, 70 fresh dung samples, especially near the watering places, in the random way were collected. 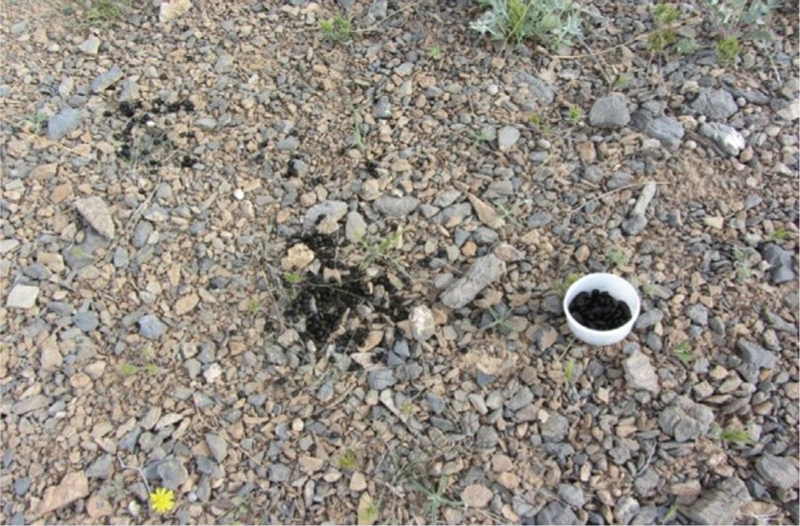 Fresh and soil-free dung samples [Figure 4] were collected by using disposable gloves and were placed separately in 100 g plastic containers. The sampling time and date, geographic coordinates, habitat name and the dung characteristics such as the consistency were recorded in each site. The collected dung samples were transported to the parasitology laboratory. 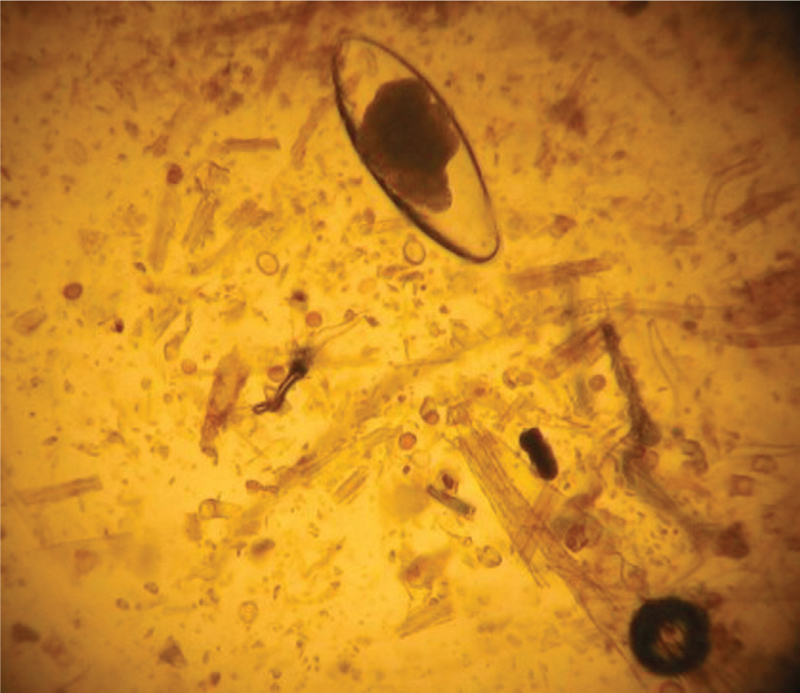 The Clayton Lane method [Figure 5] was used to investigate the parasite eggs, and the Berman method was applied to prepare and identify the parasite species. The samples were mathematically analysed by using the Statistical Package for the Social Sciences software, and Geographic Information System software were used for mapping purpose [Figure 6]. As it can be observed from the cultivation results, shown in [Figure 7], five out of the 70 dung samples (7.15%) were infected by parasite, and 35 samples (50%) were contaminated by oocyte [Figure 8], and 30 samples (42.86%) were non-polluted. 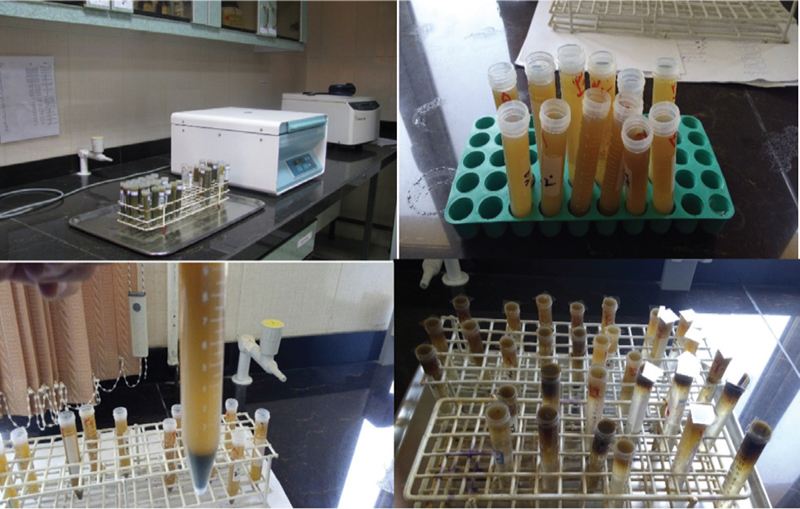 Five samples, which were contaminated by the parasite eggs, were cultured to identify the parasite type via stool cultures. 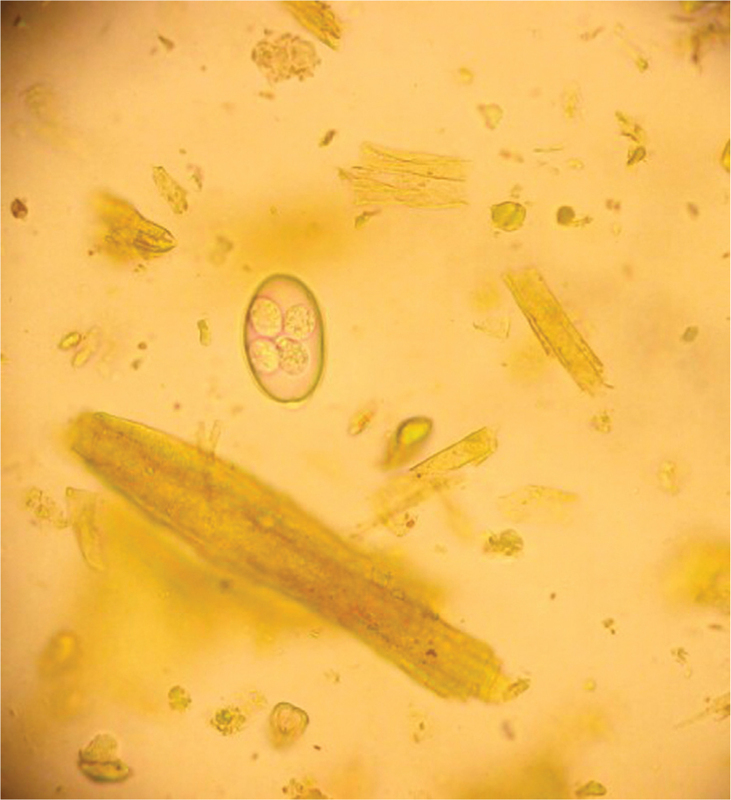 Trishuris [Figure 9] is one of the observed parasites in the studied samples. In other studies,,, this parasite has been observed in ruminant wildlife. Trishuris infection is 2.86% that is consistent with Persian fallow deer study and shows lower rates when compared to other studies. 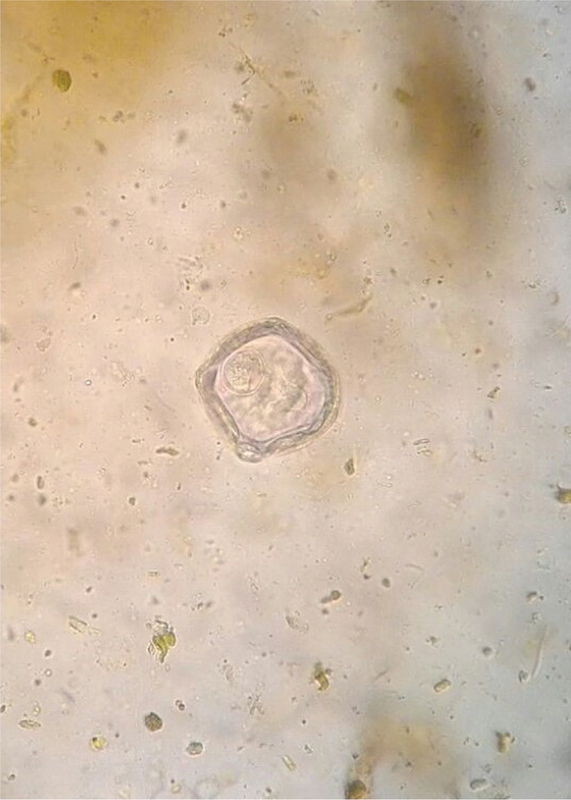 The second observed parasite was Marshalagia [Figure 10] that was also reported by Morgan et al. and Tavassoli and Khoshvaghti. Marshalagia infection percentage was 1.43 which shows lower rate of infection compared to other studies. Morgan et al. also reported that simultaneous grazing of the wildlife with livestock in pastures had the transmission potential of a wide range of helminth parasites between animals and domestic ruminants. 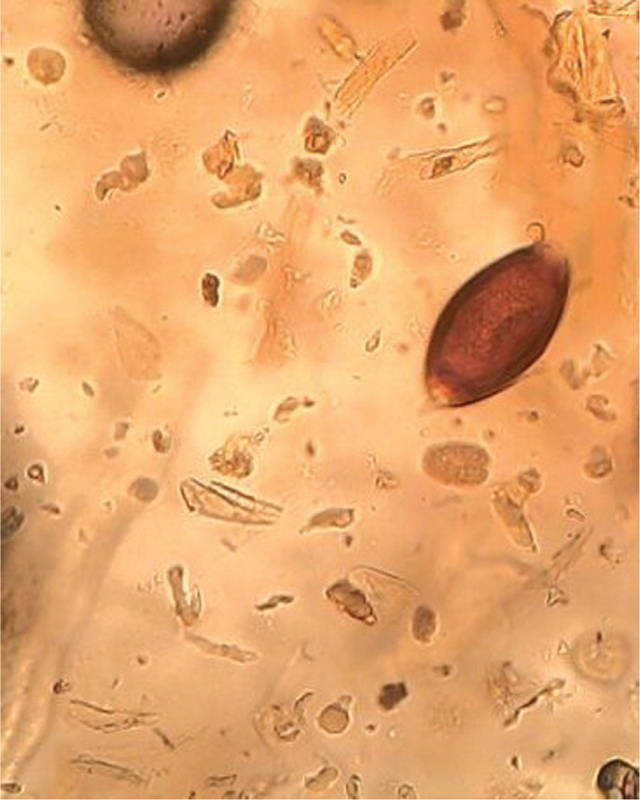 The third parasite type observed in the current study was Moniezia [Figure 11], which has also been reported by Masamha et al. and Cook et al. Moniezia parasite was detected in two deer species out of 70 studied species that reveals a smaller percentage in comparison with other studies. The main reasons for these differences in the prevalence of intestinal parasites in the deer population in this protected area compared with similar studies in other parts of the world might be the feeding method, age, appropriate ranges, weather conditions (dry air), ruminant’s strong immune system and pristine of the region. Neeson R, Stephan Love B. Managing Internal Parasites in Organic Livestock Production Systems. Organic Agriculture Centre of Canada: NSW Department of Primary Industries; 2014. Thornton PK. Livestock production: Recent trends, future prospects. Philos Trans R Soc B Biol Sci 2010;365:2853-67. Mohammed OB. Control of Gazella Parasites at King Khalid Wild Life Research Centre (KKWRC), Saudi Arabia. Zoological Society of London; 2000. 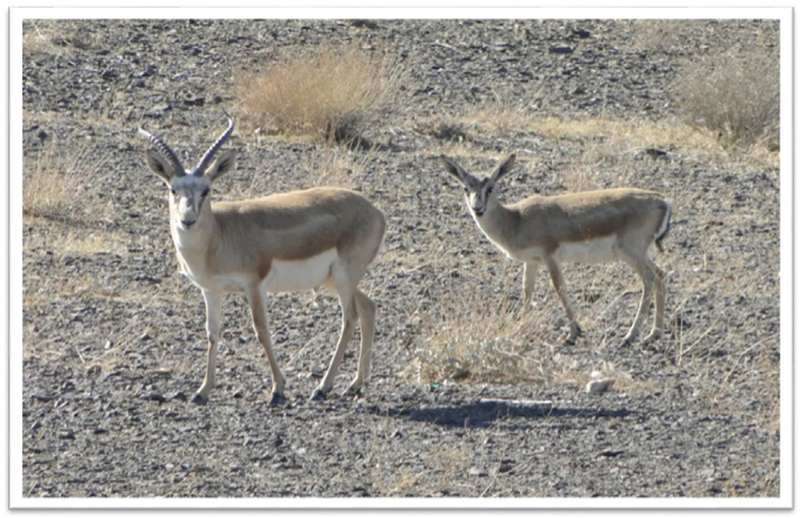 Eslami A, Rahbari S, Meydani M. Cestodes and trematodes of wild sheep, Ovis ammon orientalis, and goitered gazelle, Gazella subgutturosa, in Iran. Vet Parasitol 1981;8:99-101. Ortiz J, Ruiz R, Abaigar T, Goyena M, Garijo M, Cano M. Output of gastrointestinal nematode eggs in the feces of captive gazelles (Gazella dama mhorr, Gazella cuvieri and Gazella dorcas neglecta) in a semiarid region of southeastern Spain. J Zoo Wildl Med 2006;37:249-54. 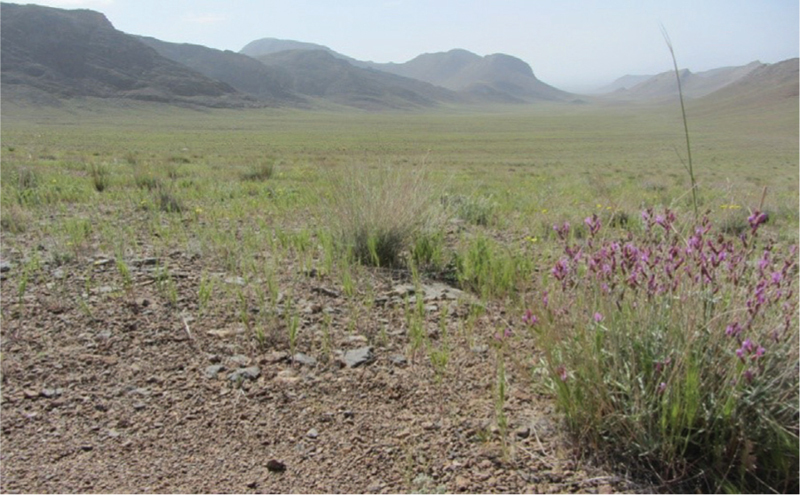 Morgan E, Shaikenov B, Paul R, Torgerson G, Medley F, Milner E. Helminths of saiga antelope in Kazakhstan: Implications for conservation and livestock production. J Wildl Dis 2005;41:149-62. 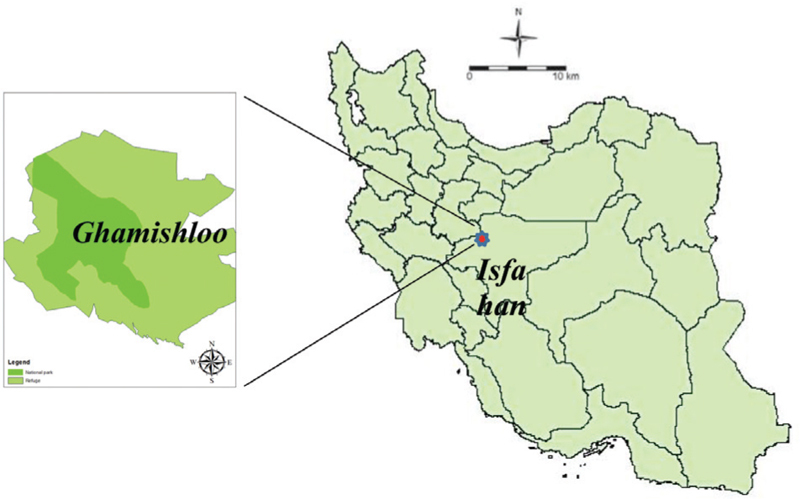 Tavassoli M, Khoshvaghti H. Helminthes and Coccidia infection of wild sheep (Ovis ammon Orintalis) in Kabodan island of National Park of Urmia Lake, Iran. Vet Res Forum 2010;1:26-9. 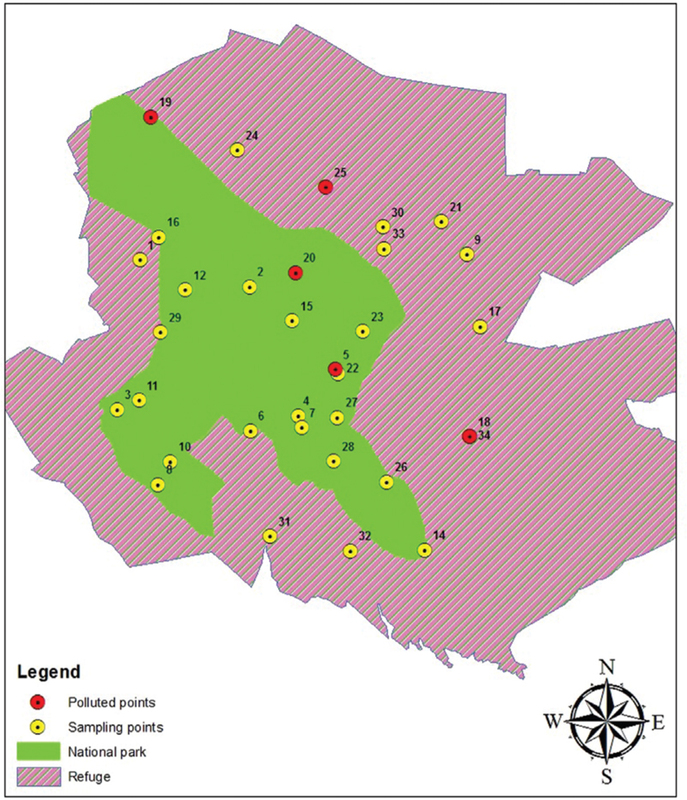 Masamha BW, Mhlanga L, Marisa CT, Gadzirayi N. Assessment of endoparasitic infestation in captive buffaloes (Syncerus caffer): A case of Mazowe Veterinary Research Station in Zimbabwe. Int J Innov Res Stud 2013;2319-9725. Cook TW, Ridgeway BT, Andrews R, Hodge J. Gastro-intestinal helminths in tailed deer (Odocoileus virginianus) of Illinois. J Wildl Dis 1979;15:405-8.